The simultaneous smoothing and edge-preserving property of the bilateral filter makes it really attractive for many image processing applications. The recent discovery of a fast implementation allows a use in real-time applications. 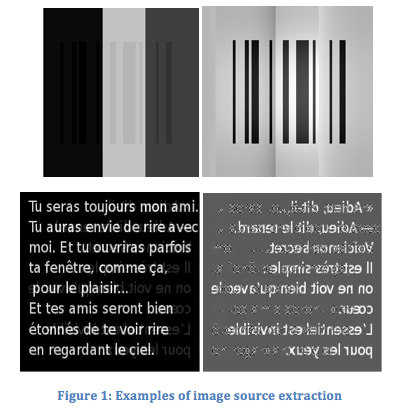 During this semester project, novel applications exploiting the edge-preserving quality of the smoother were explored: image source extraction and non-uniform illumination compensation. In daily applications such as reading a barcode, scanning a text or even taking an image through a window, a possible superposition of two sources images (i.e. the front and the back texts) can happen. The extraction of these components, such as the backside text, can often be very useful. The non-uniformity of the light distribution can be seen as a problem in applications such as microscopy. 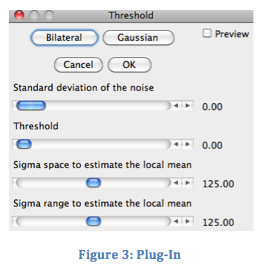 A simple thresholding does not allow to separate the zero symbol from its background (See Figure 2). By pre-processing the image (without smoothing the edges), the reconstruction can be improved. ImageJ plugins were developed for both applications permitting to work with variable parameters, computing in real-time the output images and the SNR metrics. The possibility to set a gaussian smoothing filter instead of the bilateral allowed a comparison. A study of the bilateral in different configurations gave an understanding on the appropriate configuration of both the spatial and range parameters of the filter to set.